This fresh new documentary Kickin’ It With The Kinks produced by Cynthia Butare and presented by Mundia Situmbeko has taken a subject which had never before struck me as a hot topic for serious debate – hair. Not just any hair you understand but hair belonging to women of African descent, which it turns out is an endlessly fascinating subject beset with deep-rooted and complex social traditions and controversy.Exploring these complexities through the eyes of a number of diverse characters makes for an entertaining and extremely thought-provoking film in which we explore the debate through the eyes of women in our UK multicultural society. From a white perspective if I thought my locks were high maintenance I discovered it is nothing compared to the lengths that women with the trademark thick black Afro-Caribbean hair go, to make the most of their crowning glory. I was entirely unaware of the struggle that many African women face when it comes to wearing their hair ‘natural’ and feeling accepted by our Western society. 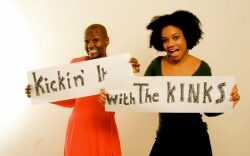 Many African women choose to ‘relax’ their hair, meaning they have it styled in a way that feels more ‘normal’ e.g. long and straight. We learn that maintaining this takes huge amounts of time and effort and is not something that can be rushed in the morning if you’re running late for work. Filmed mostly in Manchester, the director moves skilfully between insightful interviews taking place out on the streets and at one point includes a focus group debate at Manchester Metropolitan University where opinions of ‘natural’ versus ‘relaxed’ hair were thrown around among some 25 Afro-Caribbean female students. One student in particular said rather than seeing relaxed hair as a negative strain on her daily life, she argued why shouldn’t she have the right to play with the styles and length of her hair, as any other women would. We learn that creating the intricate styles plaiting and weaving hair can mean women spending whole days – up to eight hours at a time being worked on by skilled stylists who create the bespoke look their clients demand. The documentary explored many aspects of black hair care and emphasised the struggle to find products that actually work effectively and also asked, ‘If we claim to be a multicultural society, why are the shops not multicultural?’ This raised an interesting point, which was further discussed in the question and answer session with Mundia herself following the screening. We learn that this hair art is not mere vanity but something far more serious – it goes to old established rules which govern the way women are viewed by their family and wider society. It is quite shocking to learn for example that Mundia’s father was angry with her when she decided to go natural with her hair, a decision influenced strongly by the research she carried out for this film. Being ignored for weeks because your Dad doesn’t like your hairdo may seem incredible, but this is about a deeper issue around being accepted into society. Fear of rejection is a strong underlying theme running through this film. For a film that initially started as one student’s self-funded university film project, Kickin’ It with The Kinks has impressively developed a life of its own and had screenings in nine countries, reaching out to an large global audience. This film stayed with me and got me thinking – there are not that many short, low budget offerings you can say that about. Catch it while you can it’s hair today – hopefully not gone tomorrow. Interesting well written review – makes me want to go and see the film.